Deep South Dish: Crisco Olive Oils - Free Recipes and Free Mobile App! 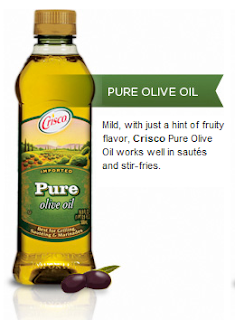 Crisco Olive Oils - Free Recipes and Free Mobile App! 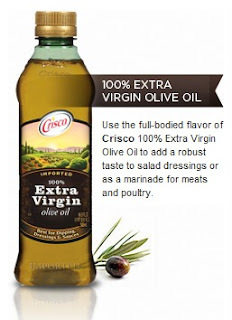 Through the Tastemaker's program from Foodbuzz, I recently had the opportunity to try Crisco's line of olive oils, available in three varieties — 100% Extra Virgin, Pure, and Light Tasting. Most of us know the benefits of including a good extra virgin olive oil in our diets to occasionally replace some of the other fats we love. Olive oil is a healthy fat, a cholesterol-free food and is high in antioxidants. But frankly sometimes the flavor is a bit too heavy for some dishes, or we need an oil that can hold up to heat. If you've been around here long, you already know that I use a good bit of olive oil, and with Crisco's lighter versions, it's easy to transition in the places where extra virgin oils just won't fit. With the lighter versions, you can also try replacing butter with olive oil in favorite dishes like mashed potatoes, or drizzled on baked potatoes. Keep olive oil in a small cruet right on the dinner table to encourage family members to use it for drizzling on salads, in soups, stews, for dipping bread, and even drizzling over pastas. And you can use it for one of my favorite tips, as a kitchen helper for easy clean up of sticky things like honey, mustard, and syrups. Extra Virgin Olive Oil is best for when you really want the olive flavor to stand out. You'll use this one for salads dressings and marinades, or to drizzle in veggies, pastas, soups, stews and dipping. Most often my salad dressing this days is a drizzle of olive oil right on the salad, with a few splashes of apple cider or red wine vinegar sprinkled on top, a few herbs added and maybe a grating of Parmesan. Bold and fruity, the extra virgin is the perfect oil for that. 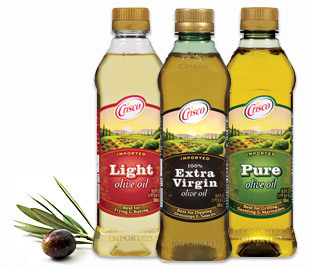 Crisco's olive oils are blended from several different sources - Argentina, Italy, Turkey, Spain and Tunisia. A code on the bottle will indicate from where the batch was derived. Mine was a blend of Spain and Tunisia. Crisco Extra Virgin olive oil is quality certified by the North American Olive Oil Association. Use the Pure Olive Oil variety when you want that olive oil flavor, but a little bit lighter. Use this one for light sauteeing, grilling, roasting and marinades. This olive oil still has the taste of the olives, but is much milder on the palate than the stronger extra virgin. I tried this when I needed some pan sauteed shrimp for a quick bisque I was cooking and it worked wonderfully. Try brushing it on meats before grilling. Also quality certified by the North American Olive Oil Association my oil came from Spain. Mild and more stable at higher temperatures, the Light Tasting Olive Oil is the one you want for frying, stir frying, cooking and for baked goods. Instead of the usual canola I would use, I used this one to pan fry pork chops for my husband - one of his favorite ways to eat them - and was very pleased with the way it fried. I also tried it to make a light roux for my Cajun shrimp stew and it tasted wonderful. This would be the oil to use as your everyday cooking oil where you want the benefits of olive oil, but not necessarily the distinct flavor of the olives. The flavor of the Light Tasting Olive Oil is very light, with a trace hint of the olives. My oil was a blend of Spain and Tunisia. Visit the Crisco site for more tips on how to use each of these oils. I really enjoyed visiting the Cooking Central section of Crisco's website, already rich with information and recipes for using their products, including the Omega 3 and peanut oil products, there's also a section for cookies, pies, kids, plus tips, seasonal cooking, and cooking basics. To help you learn how to incorporate more olive oil into your diet, there's also an entire section devoted strictly to their line of olives oils. On the Welcome page you'll find a personalized recipe slider - just drag the slider over to select type, ingredients and cooking method and get suggestions specific to what you select. For instance, choose entree, meat/fish and saute/fry and get recipes with the Crisco Olive Oil best suited for that. Select the "Recipes" tab at the top and you'll see tabs for each variety of Crisco oil. Chose Extra Virgin Olive Oil and find recipes like this Pasta with Broccoli and Bacon. Chose Pure Olive Oil and find this Shrimp and Red Pepper Linguine and more. Chose the Light Tasting Olive Oil tab for recipes like this Roasted Potatoes with Rosemary - one of my personal favorite ways to eat potatoes! There are recipe videos, a bit of history, a store finder, facts and tips - it's a great website - check it out! Pick up the free Crisco Mobile App at the website and you can bring recipes, cooking tools, shopping lists and more with you, wherever you go. Check out the newsletter, RSS feed, and stop by The Power of Family Meals while you're at the site for family mealtime ideas. Y'all know how I feel about getting folks back around the family table. Be sure to Like Crisco on Facebook to pick up tips, recipes and coupons! Disclosure: I received free product from Crisco though the Foodbuzz Tastemaker program. 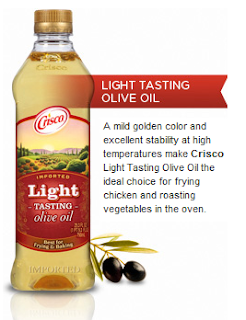 Thanks for the review of the Crisco Olive Oils! Helpful information! Garlic Chicken from Birds Eye Voila!